Enrich Gifts: Is the flu season really all that bad? 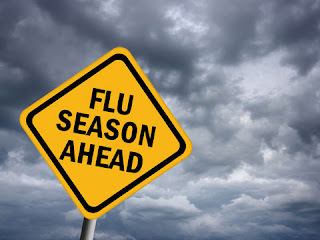 For Big Pharma, we're in the greatest season of them all -- flu season. I'm sure you've seen all the news reports lately. Flu is spreading like wildfire in a gasoline forest. The season started early. It's worse than anyone thought. It's the most frightening flu season since, well, last flu season. And the only solution to this menace comes in a convenient syringe that can be jabbed into your arm for the low, low price of $25 at your local pharmacy or supermarket. Story 1: It's going to be worse than anyone thought. Story 3: Phew! It looks like we're going to be OK after all. We're somewhere between #1 and #2 right now, and I promise you we'll end up at #3 within weeks. And, truly, I don't mean to diminish the seriousness of the flu -- if you've ever been stricken with it, you know it's a miserable experience that can be particularly dangerous for children and seniors. But please understand that much of the mania right now is being driven by a desire to sell vaccinations, and by false confidence in what these vaccines can do. If estimates are correct, the five best-selling flu vaccines will generate nearly $2.5 BILLION in sales worldwide this year. For Big Pharma, the flu is like a reliable slot machine that pays out every year. And I wouldn't begrudge Big Pharma a dime if the flu vaccine was more effective. Each year, millions of people line up for the vaccine under the mistaken belief that they will not contract flu. That false -- and totally unjustified -- feeling of invincibility may lead these same people to skip commonsense preventive measures, like regular hand washing, avoiding people who are sick, and supplementing with vitamins to build their immune systems (more on that in a moment). Here are the facts -- the Centers for Disease Control and Prevention estimate that this year's flu vaccine is 62 percent effective, which experts have the audacity to call a "good year." Even worse, the vaccine is less effective for seniors -- arguably the group that needs protection most. If you're a senior who got the flu shot and are wondering if you'll catch the flu, you might as well flip a coin. The only way to stay truly safe from flu is to never catch it in the first place. Here are a couple vitamins that you can use for making your immune system fortress strong -- and to keep flu from storming the castle. Vitamin D: Get plenty of sun and take 5,000 IU daily (2,000 to 3,000 IU for kids). Vitamin C: Adults should take a minimum of 3 grams per day (kids should take less). You should take as much as your body will tolerate without diarrhea. These immunity-boosting vitamins are safe, inexpensive, and they'll keep you healthy long after "Flu Mania" has come and gone.